"You will be surprised at the yarn you find which you had forgotten!" Every summer in the Pacific Northwest we get at least one week of decent, if not downright hot (meaning 85-90 degree) weather. I look forward to it for the annual Airing of the Stash. This has become one of my knitting rituals, and I plan ahead for it every year. Airing your stash can be as simple as going through tub by tub and picking through it to see what's in there. You will be surprised at the yarn you find which you had forgotten! I live in a damp climate that is subject to mildew and insect invasion, so I like to set all my yarn out on a sunny day to let it bake nicely in the sun. This really helps to reduce the "whiffy" smell that yarn can get. It is also a chance to wipe out the bins and look for signs of Trouble (like insect droppings and cocoons) and examine yarn for other signs of trouble. It is tempting to do an annual "stash airing" in spring, as part of your spring cleaning routine. But I like to save it for the peak of summer, because it is a fun way to play with yarn without having to actually knit it and get all sweaty. Taking everything out and rearranging it also puts me in mind of projects for the winter. I might look at a skein and suddenly think, "That would be great for a hat." Or I might spy a skein that I bought ages ago for no particular purpose, and realize that it is in a color that my aunt would love. "I should make something for her out of that skein," I will think. I make a mental note, and move that skein up to the top of the pile. 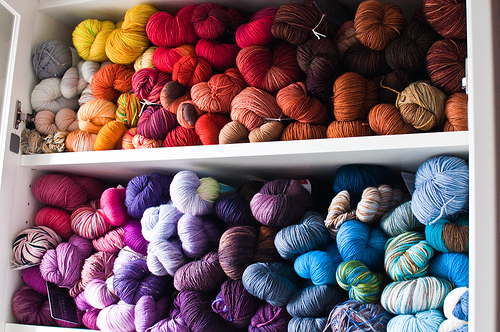 Airing your stash is also - if you will forgive the sentimentality - a celebration of the abundance of yarn you already own. It's such a great reminder that it puts me off buying more yarn for months afterward, recalling how much yarn I really have.